Memorial Day isn’t just the day we honor and remember those who have passed on; it’s the unofficial mark of the beginning of summer. It seems like a lot of people go camping or have barbecues on Memorial Day weekend. My friends and I were recently discussing the differences in barbecues in Utah and barbecues in the South. Apparently in the South having hamburgers and hot dogs isn’t a barbecue, it’s a cookout. In my experience, a barbecue can consist of anything from hamburgers to chicken to ribs. But in the South they expect ribs and lots of meat (at least from what I could find.) So what are the different types of barbecue styles across the nation? Read on to discover! *Quick disclaimer, I couldn’t really find any information on barbecue styles from the Mountain West or West Coast, so if you have any information please comment below! In east Texas they like to use both beef and pork, they like to chop, instead of slice, their meat and serve it between buns with lots of hot sauce. In Central Texas the meat is the main component of any BBQ and the sides and sauces are secondary. Sauce: Generally none, or on the side. When they do use sauce it’s thick, sweet, spicy, tangy and savory! Meat of Choice: Pork, in all forms. Sauce: Yes, a tangy-sweet, tomato-based sauce served on the side. Barbecues in Kansas City sound fantastic. They like to use different meats, but mainly beef and pork. The meat is cooked super slow and preferably over hickory wood. The sauce used to accompany the meat is most commonly a thick, sweet molasses-and-tomato mixture. Specialty: Burnt ends which is the end of a cut of brisket. North Carolina uses two styles of BBQ: the Lexington-style, which tends to use just the pork shoulder or ribs, and the Eastern-style, which uses the entire pig. Both styles agree that the meat should be brushed with a spice-and-vinegar mixture while cooking and the served with a ketchup-based sauce. Meat of Choice: Pork, whole pig or chopped. Sauce:In the West, a thin spicy-sweet sauce for dipping. In the East, a tangy and sweet sauce. South Carolina BBQer’s also like to use pork. The sauce they like to use is usually more mustard-based and includes brown sugar and vinegar. Meat of Choice: Yes, they like to use a heavy and tangy with a little heat. Barbecues in Kentucky are a little different; they use a lot of mutton or lamb. Honestly, I couldn’t find much about this style of barbecue! 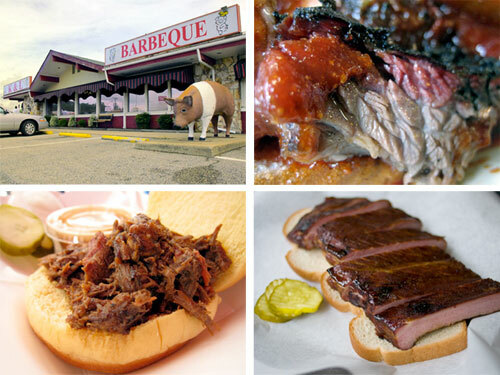 Alabama style BBQ is influenced by both the Texas and Carolina styles. They like meaty sandwiches filled with pulled pork and cole slaw. Don’t forget the white sauce! White sauce is a mayonnaise and vinegar mixture that is a must have! Specialty:Pulled pork sandwich with white sauce. There you go, some of the most common, most tasty, and most known types of barbecue. Whether you enjoy barbecuing hamburgers and hot dogs, chicken or the things mentioned above, don’t forget the sides, drinks and of course great company!